I have not paid much attention to Italian politics other than knowing that generally the governments have been unstable ever since Mussolini. Who can understand Italian politics anyway? It is especially difficult for an American since it is a parliamentary style of government which generally mystifies us from the start. Add to that the behind the scenes maneuvering and seeming endemic corruption and you have layer upon layer of obfuscation. However another blogger that I follow brought my attention to the government soap opera that continues unabated. Imagine that in the U.S. our President got into a public shouting match with the other most important figure in the SAME party who also was the speaker of the house. I’m not saying a virtual shouting match with dueling press releases but an actual shouting match. 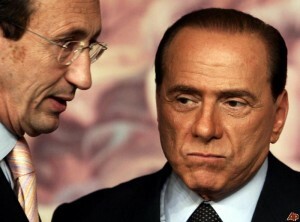 This happened between Silvio Berlusconi and Gianfranco Fini in April of this year. As you can imagine, things then continued to get worse. Of course Berlusconi is a media mogul in Italy and one of the country’s richest men. He owns three of 7 television networks and a widely read newspaper as well as a ton of other stuff. So the Berlusconi media empire went to work on Fini but that just seems to have contributed to the cynicism of the Italian politicians and voters. Next Fini established a secondary political party with a bunch of members of parliament and the senate which hamstrung Berlusconi’s efforts to limit wiretaps which were providing damaging evidence against members of his government. Actually it goes beyond that. Since the Fini rebels now have the crucial swing voting power then Berlusconi almost has to go them hat in hand to ask to go to the bathroom. 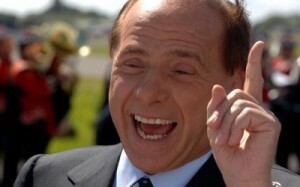 This does not make Silvio a happy man as you can imagine and can see in the photo below. Ah the mudslinging on both sides would leave make some American politicians proud. The drama continues with a lot of cunning moves on both sides. 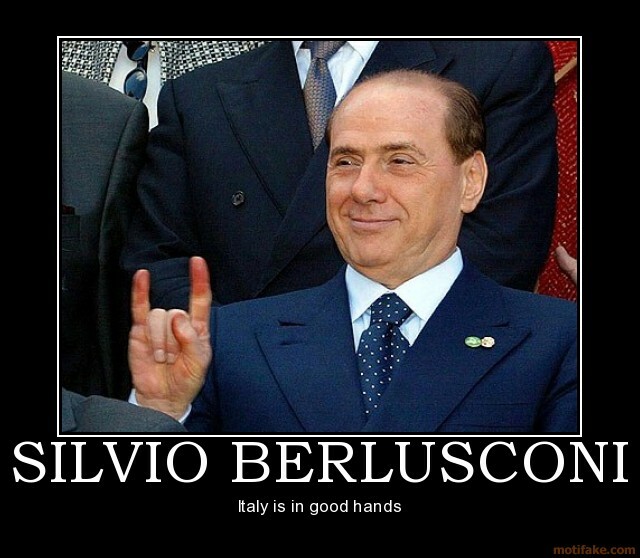 My pal in Torino, Massimiliano, is no fan of Berlusconi and generally abhors the government corruption in Italy. But is Fini any better? 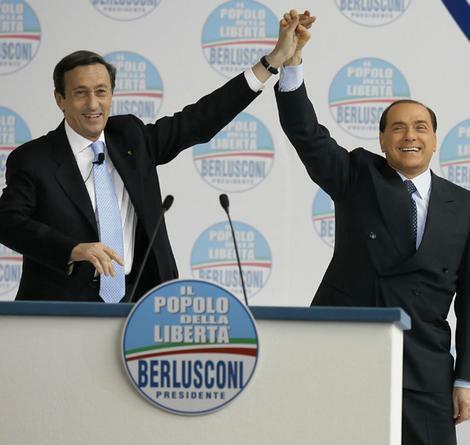 He led a neo-Fascist party that he merged with Berlusconi’s party to get Berlusconi elected the last time. In 1994 he praised Mussolini for the record – a statement that he is busily running away from. For me, reading about Italian politics is kind of a humorous break from our own crazy politics with the Tea Party and some of their wacko candidates and the ever-present Sarah Palin. You only need to look at the photos below to see that while he may or may not be evil (I vote for evil) he is entertaining. Maybe that’s how he stays in power – by telling jokes and playing the buffoon while having fun with women, enjoying his wealth and protecting himself – the dream of so many Italian men. However if I were an Italian I expect that I would be as disgusted as Massimiliano. By the way you can click on any image to get it enlarged and allow you to flip through the images. I can hardly wait for the next chapter in this political comedy in Italy. This entry was posted on Monday, October 18th, 2010 at 8:54 am	and is filed under Culture. You can follow any responses to this entry through the RSS 2.0 feed. You can leave a response, or trackback from your own site. Ok, politics are exactly what I am hearing about right now. It’s dinner conversation when I’m around. The Italians don’t understand our politics either. I’m asked about many things that go on in the US (The Tea Party, the health plan, Afghanistan, the decision begin a war with Iraq, why the people believe the obvious lies they are hearing on TV, and on, and on…). I answer as I understand things to be (or not understand as the case may be), and they seem to feel that some things are a little similar: The apathy of the people, the emphasis on insignificant details (like what the O’bama kids are wearing this week, or whether the president is US born or not), and more. I have yet to meet someone who will admit to liking Berlusconi, and some of my new friends are active in local democratico politics. Last night my friend Roberto came in from work (he works in TV production) upset that Berlusconi had been able to get something passed yesterday that says he cannot be arrested, tried and prosecuted for any crimes committed before and during his time in office (This sounds familiar. Didn’t we deal with something similar with Clinton and Bush?). From what I can gather from my friends here, there is much concern and fear about the lack of a vision for the country and what the future will bring. Perhaps I’m wrong, but there seems to be similar feeling in the US. So, that is my take on the politics so far during my trip.